This version will only autoloot herbs! Normal containers still open up the loot popup! Now with autoloot herbs in radius! 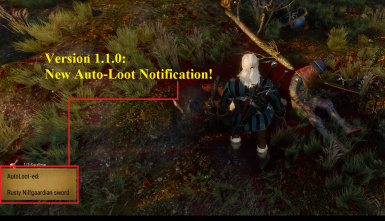 For Witcher 3 Version 1.21. Recommended version! 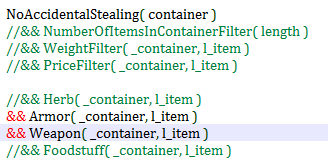 This version loots ALL from container but also prevents accidental stealing! Updated for Witcher 3 version 1.21. 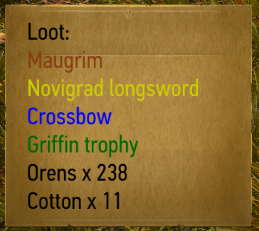 Loots all items! Even steals! You will be attacked if caught stealing! Watch out for angry guards coming after you! This patch makes the mod require two key presses to Radius Loot, instead of only one. Requires both a key bound to Action=AutoLootRadius and another one to Action=AutoLootRadius2. Requires one of the original versions of the mod. This version loots herbs and corpses. Lots of people requested it. 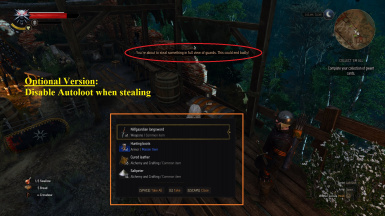 This version of the mod will disable stealing and allow you to steal anything without consequences. 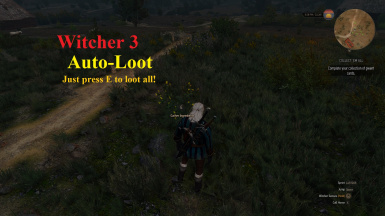 Besides that, it loots All Items. 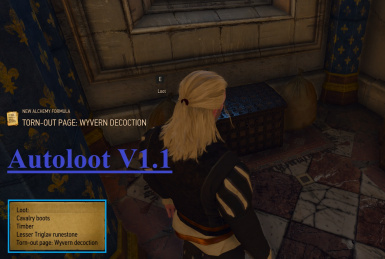 This version only auto loots containers with no more, no less than one item in them. Requested by rs1485. Updated to 1.5.0! This version only autoloots weapons & armor if they are worth at least 100 crowns. Requested by mordek113. Updated to 1.5.0! AutoLoots uncommon weapons and armors, alchemy items, only drinks/alcohol, also books/notes/diagrams. Crafting ingredients too. Requested by user linneh. Updated to 1.6.5! This version is a mix between the No Accidental Stealing and One Item Only versions. Requested by Walteriusmaximus. Updated to 1.5.0!